The English library–inspired drinking den at Raised by Wolves, featuring a marble-topped bar and custom wood flooring. Photo by Zack Benson. With its bucolic murals, the Raised by Wolves bottle shop telegraphs Provence. Photo by Zack Benson. Nautical Nonsense Punch (white rum, dark rum, Cognac, lime, grapefruit, falernum, honey, bitters, seltzer). Photo courtesy of Anne Watson and Spoonfed Agency. Left: Partner Erick Castro. Photo by Gabe Fonseca. Right: Partner Chris Patino. Photo by Arlene Ibarra. Dreadlock Holiday cocktail (two types of Jamaican rum, Suze, bianco vermouth, pineapple liqueur). Photo courtesy of Raised by Wolves. 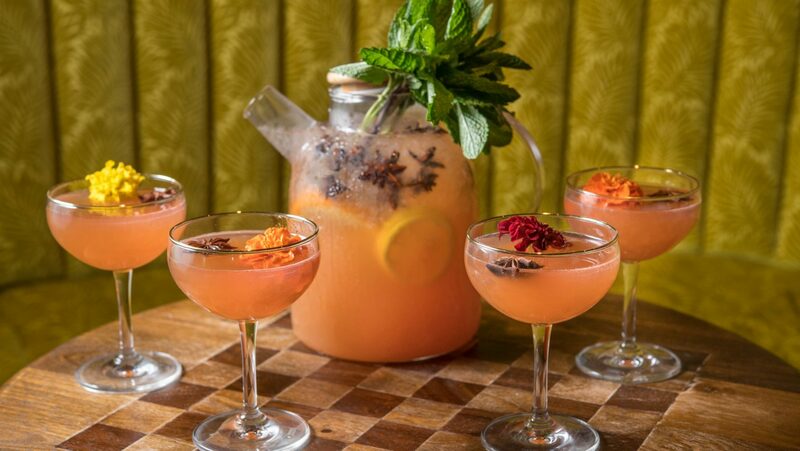 Promise of Paradise Punch (blanco tequila, lemon, Cappelletti Vino Aperitivo Americano Rosso, strawberry, sparkling rosé). Courtesy of Anne Watson and Spoonfed Agency. Westfield UTC, the posh, open-air San Diego mall near La Jolla, may seem like an unlikely backdrop for Raised by Wolves, the elegant spirits shop and speakeasy-style bar that recently opened in one of its retail spaces. But for Consortium Holdings (CH) Projects, the homegrown hospitality collective behind such venues as Ironside Fish & Oyster, the steakhouse Born and Raised, and the tiki bar False Idol, it was an opportunity, spearheaded by CH Projects’ cofounder Arsalun Tafazoli along with partners Erick Castro and Chris Patino, to introduce a dynamic beverage program to a suburban setting. 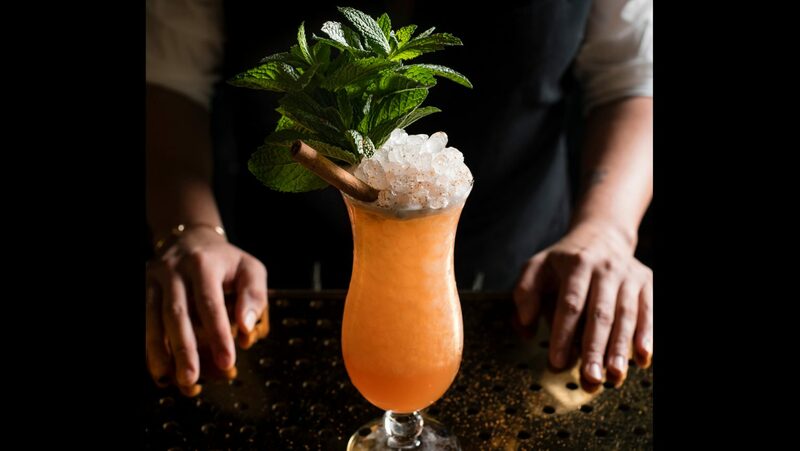 Castro, who also joined forces with barware emporium Cocktail Kingdom to open the New York City hangout Boilermaker a year later, first made a name for himself in San Francisco, as a bartender at Bourbon & Branch and the beverage director at Rickhouse. In addition, he was an ambassador for Plymouth and Beefeater gins at the liquor behemoth Pernod Ricard. Another Pernod Ricard veteran, Patino, was also instrumental in creating the vision for Raised by Wolves—and bringing it to fruition. 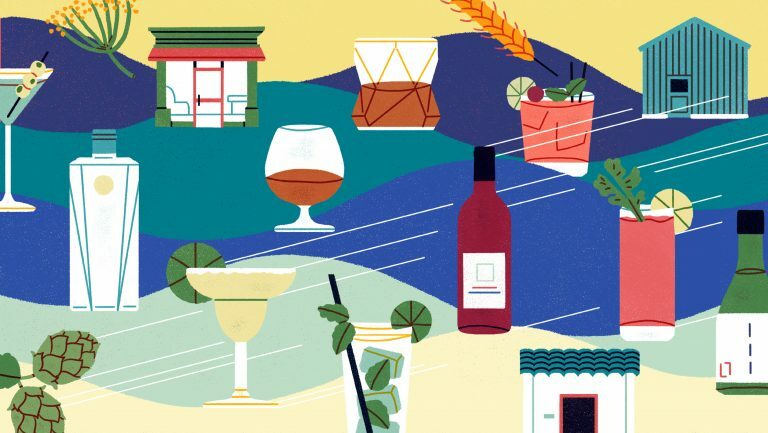 Paul Basile, the principal and lead designer of BASILE Studio—the local firm that designed the Raised by Wolves space—has “created a transformative experience,” says Castro, explaining that when you’re inside the bar, it’s easy to forget you’re surrounded by chain outlets like Nordstrom and Shake Shack. That such an imaginative atmosphere thrives in a cookie-cutter mall setting is perhaps Raised by Wolves’ biggest surprise. 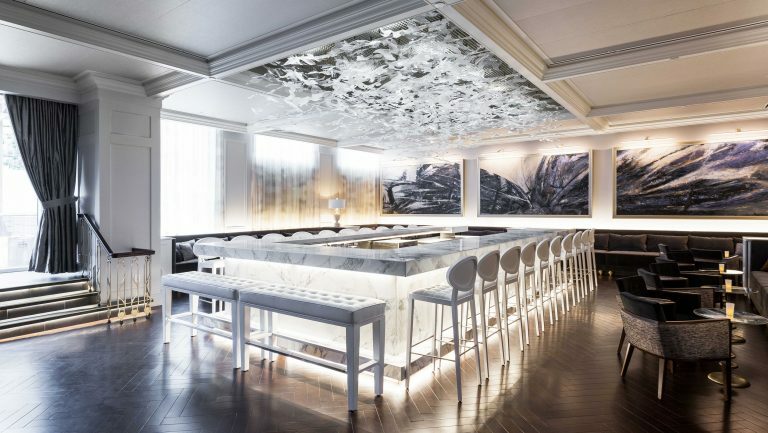 Tafazoli was inspired by 19th-century European design aesthetics and wanted the space to reflect that—and Basile, who specializes in bespoke, built-in-house designs, delivered. “We wanted to completely disconnect from the mall experience,” says Basile. One feature that helped them achieve this is a massive pergola with a natural-light LED system designed to mimic the day’s shifting light in the span of an hour. In one sitting, guests can see the light morph from dawn to dusk. 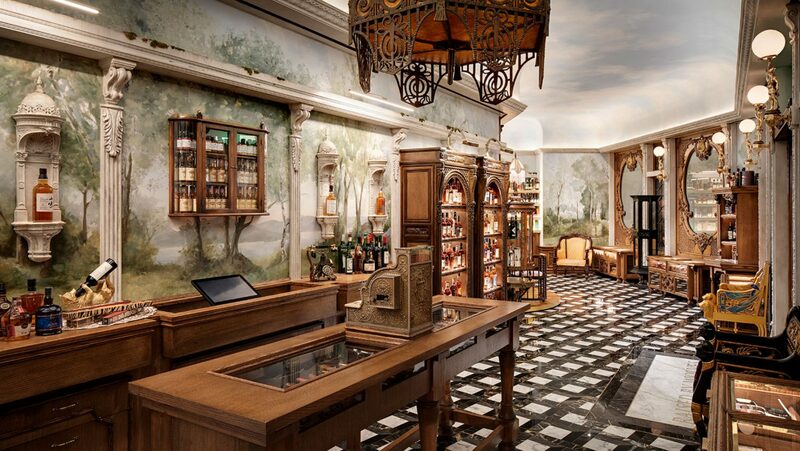 The bottle shop, awash in wood and bucolic murals, channels Provence, a softer contrast to the bar, which takes its cues from clubby English libraries. As in all of Basile’s projects, natural materials were emphasized, including stone, brass, and steel. “All of the furnishings are eclectic—some custom, some found,” says Basile. “The bar top is an African gold marble, and on the floor we used porcelain metallic tiles alongside custom walnut and oak parquet flooring.” Bar stools sourced from London were originally aluminum but are now cast in brass and upholstered in Pierre Frey fabric. 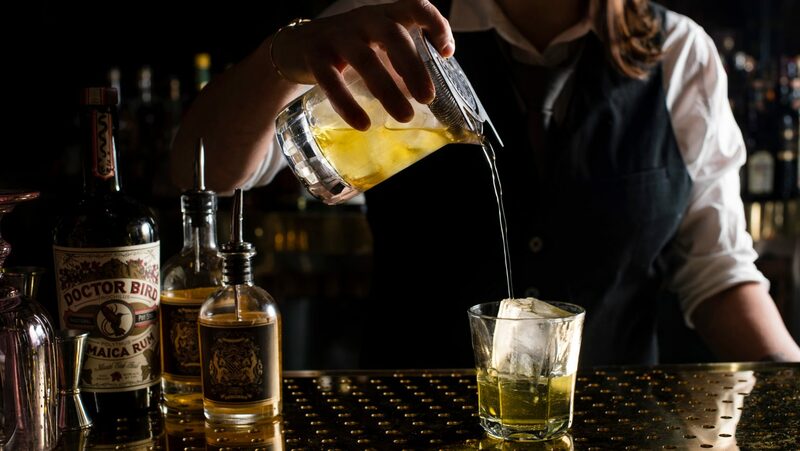 To get to the bar, patrons must pass through the shop—a strategic setup that was designed to boost revenue—when patrons leave the bar, they have an opportunity to buy the spirits they were just enjoying in their cocktails. 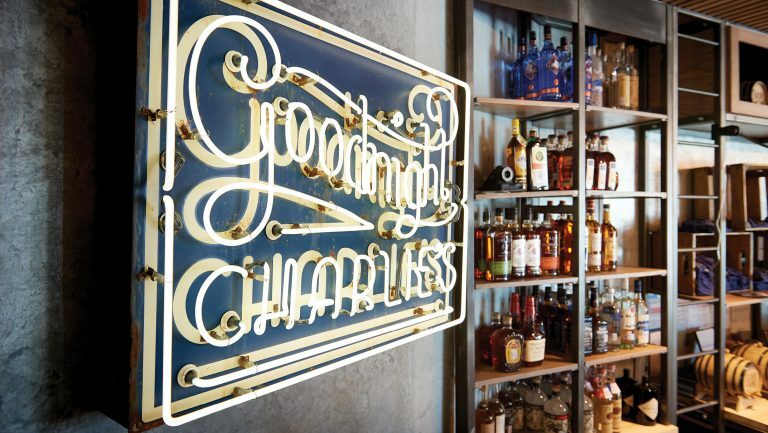 Patino describes the retail shop as “an adult candy store where everyone touches the bottles.” With the help of beverage director Anthony Schmidt, Patino has thoughtfully curated a library of more than 700 spirits. 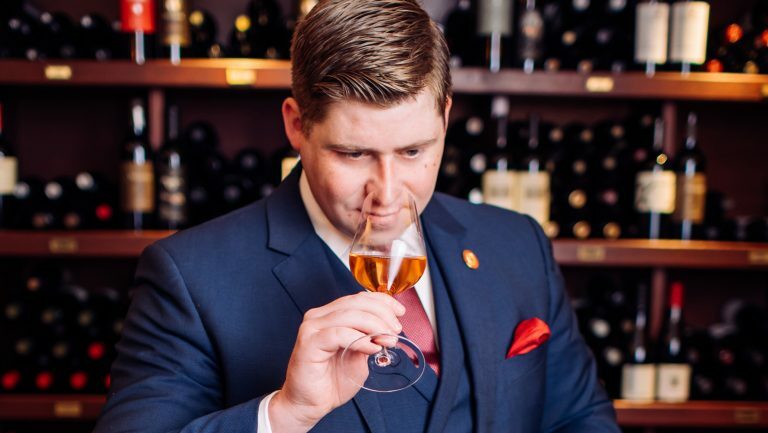 Some are rare and expensive, like the Navarre Cognac Vieille Réserve, which Raised by Wolves sells for $238—and the even more exclusive 18-year-old Japanese whisky Yamazaki Mizunara, which retails at the shop for $3,495 a bottle. Patino points out that the Japanese whisky category is seeing particular interest from customers. A more gently priced spirit, like the Rancho Tepúa Bacanora ($54), for example, encourages intrigued customers to expand their repertoire of agave spirits. Education is a priority for the small staff of eight, and that’s why a hands-on approach is encouraged. “Everyone does everything,” says Patino. 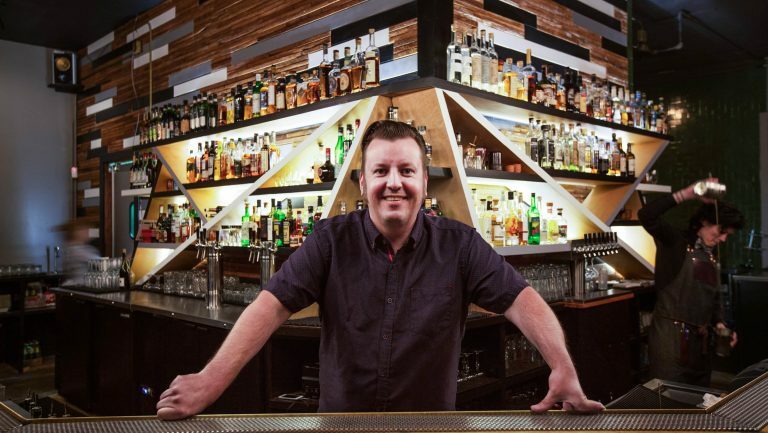 “The bar is not a barrier.” Talented team players are sought out—ones who might be serving cocktails on the floor one night and working their mandatory weekly retail shift another. That role in particular is invaluable. “You have five minutes to make an impact on a customer,” Patino says, “so getting staff excited about the origins of products makes a big difference.” Patino is also on hand all the time to help educate and engage customers. 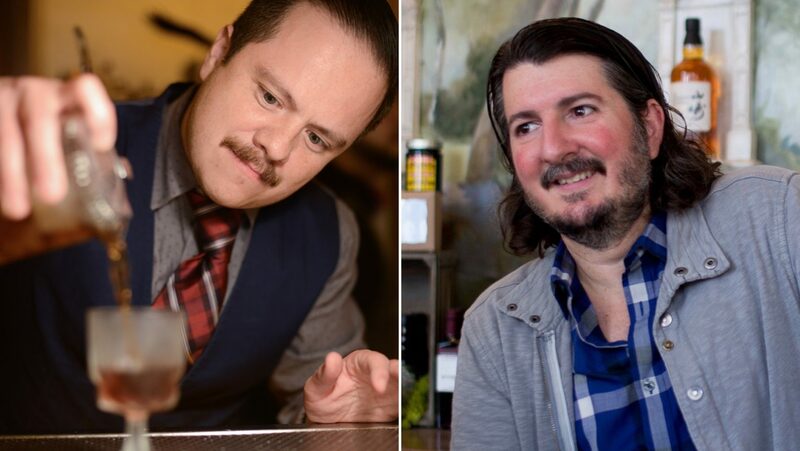 Castro worked for a year and a half on fine-tuning the drinks menu for Raised by Wolves. The final incarnation features the categories Cool & Refreshing, Stirred & Direct, and Rich & Creamy and offers such cocktails as the Pelvic Sorcery (High West Silver Whiskey Western Oat, Four Pillars Bloody Shiraz Gin, lime, hibiscus, absinthe, orange bitters), the Island Old-Fashioned (coconut fat–washed Irish whiskey, banana liqueur, Peruvian bitters, Angostura bitters), and the Boogie Board (Plymouth navy strength gin, honeydew, lime, coconut, pineapple, whipped cream). 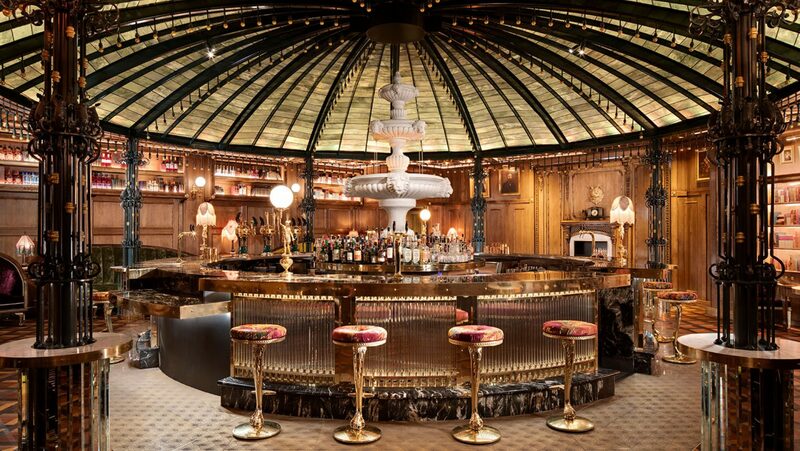 In line with the shop’s penchant for stellar spirits, there is also a Reserve Cocktail List, which includes a $175 French 75 made with circa-1950s Tanqueray London Dry Gin. Draft cocktails, punches, and unfussy boilermakers also make an appearance. A location tucked away in a mall hasn’t deterred Raised by Wolves from quickly finding a devoted clientele. Customers are curious, eager to elevate their knowledge of spirits, and grateful to be able to enliven a possibly ho-hum shopping excursion with a thrilling, offbeat booze purchase.